Is Your Organization ‘Fit for the Future’? Rik Farenhorst, CIO of Transavia and chairman of the DASA Leadership Forum, presented lessons learned from Transavia. He stressed the importance of changing mindsets and giving equal, if not more attention, to creating desired “behavior” change and not relying too heavily on structure, processes and automation and hoping that the right culture emerges. “People first,” “live your values” and “lead by example” were his key messages, stressing that values must be translated into corresponding desired behaviors as well as unlearning old ways of doing things. Another important discovery was accepting that not all teams are so far and not all teams can mature at the same speed. A great example of “lead by example” was the leadership team’s daily standups and visualization of strategic priorities, gaining more situational awareness and shared understanding and commitment. Matthijs Dee and Ivo Carton from ABN AMRO presented their journey from Agile to DevOps, also pointing out the fact that teams mature at different speeds and the need to share lessons learned between teams. ABN AMRO adopted a DevOps playbook that teams could use, containing a kind of toolkit for improving team capabilities. Equally, Dee and Carton noted ABN AMRO’s challenges in moving from “command and control” and traditional hierarchic management models to new leadership styles and behaviors. In ABN AMRO’s case, the organization needed to focus on BizDevOps—it’s not all about code, it’s about delivering business value. Farenhorst mentioned “values” in his presentation, while Dee and Carton mentioned “principles.” Both of these concepts need translating into team behaviors and leadership behaviors must help empower teams to make this shift. In the presentation of Paul Wilkinson from DASE “DevOps Will Fail … Unless,” he revealed the findings culled from more than 400 global teams having participated in the Phoenix Project DevOps simulation and gave a Top Three set of takeaways. The first was the need to focus on BizDevOps—making the shift from “features” to “outcomes” and from a flow of “code-to-commit to a flow of “idea-to-value.” This was also one of the top challenges for organizations at the most recent DevOps Enterprise Summit. 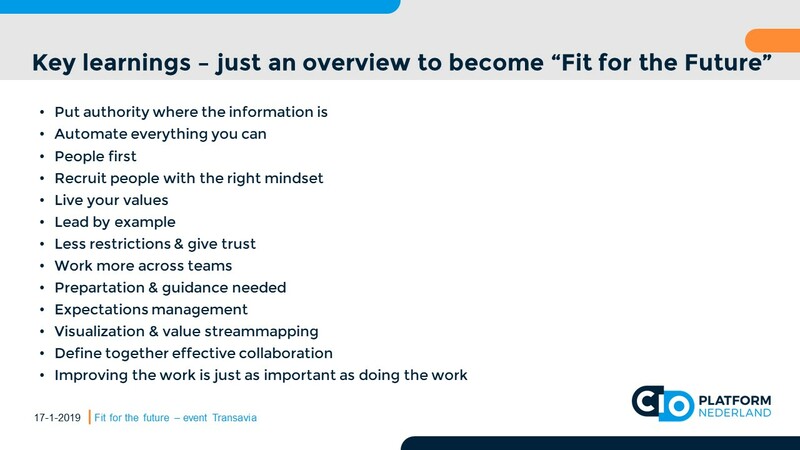 The second tip mirrored advice from Transavia and ABN AMRO: The need to define, agree and commit to “desired behaviors” and what is effective collaboration (here is an example of what I mean). The third tip was embedding continual learning and improvement as core behaviors. DevOps is new and all about experimenting—it is a long journey and needs to be done as iterative improvements. At the same time, the pace of change coming at us is increasing, as is the amount of change. Teams need to be able to respond to change. I also quoted Mike Orzen, author of “Lean IT”: “Improving your work is just as important as doing your work”; as such, impediments and improvements should also be made visible on the backlog of work for teams and leaders must ensure adequate time is given and reserved for work-in-progress, for teams to improve. An interesting discussion was around “control” and how to empower the management layers and have them empower the teams. As a CIO, this layer between you and the work floor can diffuse your vision by the time it reaches the shop floor and at the same time leave you unaware of what is happening. Management by walking around was suggested, as a CIO being visible on the shop floor and soliciting feedback. Listen to concerns and enter into a dialogue about vision, goals and what it means. Teams often are faced with fear, uncertainty and doubt (FUD) about new ways of working. What will it mean to their job? To their responsibilities? And will they be able to do it? Leaders must remove the FUD and create a safe environment. Safe to take risk, to experiment, to fail, to give feedback. Managers must foster a “no blame” culture. A study by Google (2012) called Project Aristotle, named in tribute to Aristotle’s quote, “The whole is greater than the sum of its parts,” looked into why some teams work and others don’t. One of the key conclusions was that “psychological safety” was the “it” factor: A sense of confidence that the team will not embarrass, reject or punish someone for speaking up. Change team behaviors. We adopt these approaches and don’t see the behaviors we expect. Not everybody wants to change. Leaders need to be able to identify the silent killers, what is under the water, what are drivers for working against. At the same time, teams need to be willing and able to work effectively as a team and need team training (not just individual training). Team training also needs to address soft skills such as communication, feedback and collaboration. Leaders also need new skills in organizational behavior management to be able to identify behavior drivers and how to create sustainable behavior change. Lead by example was named, but what is that? What behaviors are expected from leaders? Sometimes managers are only one step ahead in this new working. DevOps is new, there is no fixed framework; it is about experimenting what is right for your organization. This is all new. Ask yourself, “Why are we doing Agile, DevOps, Lean? Are we adopting these approaches as a goal in themselves? Or are they to solve a specific set of problems or deliver a specific set of results? And how does this relate to strategic goals?” This must then be translated into, “What is in it for ME?” for the various stakeholders (business, IT management, teams, customers). Success can only be achieved end to end, which means all end-to-end stakeholders must understand the “why” if they are to commit to the journey. Build empathy and trust and asking questions to get open feedback—not telling (command and control). Authenticity: To build trust, be empathetic to FUD; listen to concerns; demonstrate (words and deeds) how these will be taken seriously; and recognize achievements. Empathy must be authentic; if your behaviors are not seen as real, you will lose the trust you are trying to create. Shift from a (real or perceived) “blame culture.” Failure is OK as long as we learn and improve as a result. If there is no trust, then people fear consequences of making mistakes and are less willing or likely to want to experiment or speak up. Leaders should show vulnerability, too. Set an example of having failed and learned. Admit in these turbulent times when new ways of working really are new, managers don’t have all the answers—it is a journey of experimenting, learning and improving and giving feedback. Allow teams time to learn and discover themselves. Recognize that not all teams mature at the same speed, appropriate leadership styles and coaching for teams. Use external (to the team) coaches. Be prepared for the difficult discussions and decisions. Not everybody can and not everybody wants to change. If you are dependent upon heroes, get rid of them—literally or metaphorically. One example noted was a toxic working culture with teams held to ransom by the hero, while another example was having the hero share knowledge, coach and create more T-shaped capabilities. Look for “change champions” in teams—peer level respect. Empower them with the right skills and recognize their contributions and the team successes. “Give a podium” to success from desired behaviors such as experimenting, learning and improving. From the discussions it was clear that C-level managers need to learn new skills and demonstrate new behaviors, while management layers must learn more behavioral and organizational change skills. Teams must not only learn DevOps technical skills, but also team-building and soft skills. CIO Platform Nederland and DASA will be organizing future events and sharing content and experiences from member organizations to address these needs as a follow up to this kick-off event. Arnoud van Gemeren (Contact Media BV) also wrote an article (Dutch) about this event.